Domain results can sometimes be reported inaccurately. For example a domain showing available when it is already registered, or a domain showing as registered when it is available. This page explains the common causes. WHMCS can check the availability of over 200 different domain extensions as standard by connecting to the relevant whois server for the domain in question. It does this by looking through a list of common whois servers contained with in the resources/domains/dist.whois.json file., then looking for any custom whois servers specified in the user-modifiable /resources/domains/whois.json file. Alternatively, select your domain registrar as a lookup provider (if supported by the module) instead. This error indicates that your firewall is blocking the whois port; 43. Please ensure port 43 is open. It could also indicate your server is unable to connect to the specific whois server listed in the /resources/domains/dist.whois.json file - ensure your server is able to connect to the whois server on port 43 for the TLD listed in this file. This indicates that an entry does exist in the resources/domains/dist.whois.json file for the TLD in question, your server is unable to resolve it. Double-check with the IANA database that you're connecting to the correct whois server. If you are, speak to your server admin to investigate why you server is unable to resolve it. 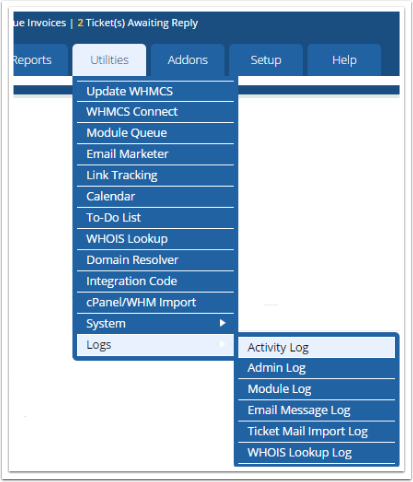 If there are no errors recorded in the Activity Log, but no domain results are displayed on the availability check results page. Refer to the Troubleshooting Order Form Issues article. The most common cause of this issue is that WHMCS is configured to use multiple currencies, but a price is not configured in the currency currently in use. To resolve this issue, make sure that you have all currencies configured on the Setup > Products/Services > Domain Pricing page. Click the Open Pricing button for the TLD in question. For example, when offering 2 Year Pricing term in the USD currency, specify the 2 Year Pricing term in all of your other currencies.